← Your Next Favorite Book Sale! Still on Sale and a Game to boot! You’re in luck! 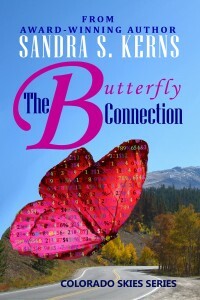 The Butterfly Connection is still on sale for 99 cents! Why is this still on sale even though Cyber Monday is history? Because I want you to have a chance to read it before the follow up novella, Butterfly Bride comes out. I also want you to have a chance to decipher some code hidden in the butterfly on the cover. The first two readers to decipher the code and send me the answer in a comment to this website, will receive a FREE ebook copy of Butterfly Bride. Stop back often for clues to help in your quest. Let me know what you liked about The Butterfly Connection and what you might expect to learn in the novella. As an added incentive, I’m revealing the cover for the novella here. I hope you like it. 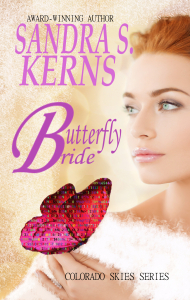 Butterfly Bride is the follow-up that several readers have asked for so they can visit Artemis and Emma again. Two years have past since Artemis told Emma he would call and she said she would answer. Artemis has finally worked up the courage to ask Emma to marry him, but even if she says yes, will it ever happen? Someone is sabotaging their friend’s bar and trying to ruin Clandestine Investigations where Emma now works. Will they ever make it to the alter or will one of them pay the ultimate price to save the other? Find out in this Christmas novella written for my Butterfly Connection readers.